Girl is NOT a 4 Letter Word: Poseiden's Ladies Day At The Berrics is This Weekend! 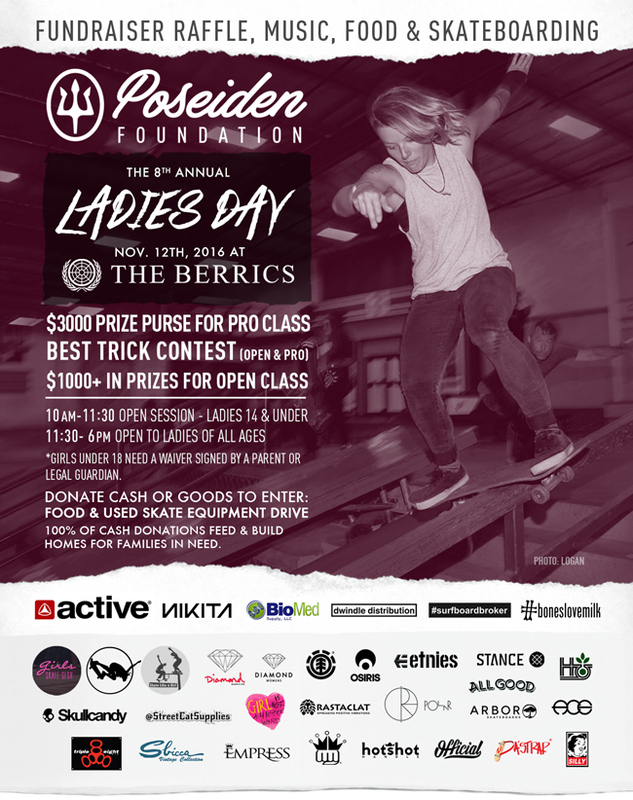 Poseiden's Ladies Day At The Berrics is This Weekend! SAVE THE DATE: LADIES DAY AT THE BERRICS NOVEMBER 12, 2016!! The Poseiden Foundation's Ladies Day at The Berrics is always amazing, but this year it gets even better! This year they've changed the contest format, added a Pro Division Best Trick $3,000 Prize Purse, Open Class and 13-under Best Trick 1,000+ in Prizes! And Poseiden Foundation along with The Berrics have increased the amount of #sponsors donating towards this year's awesome prizes and giveaways! *Bring a canned food item, donate skateboard equipment, or make a monetary donation.